How can genetics contribute to management of COPD in the future? Chronic obstructive pulmonary disease (COPD) is a common problem worldwide, and it is recognized that the term encompasses overlapping sub-phenotypes of disease. The development of a sub-phenotype may be determined in part by an individual's genetics, which in turn may determine response to treatment. A growing understanding of the genetic factors that predispose to COPD and its sub-phenotypes and the pathophysiology of the condition is now leading to the suggestion of individualized therapy based on the patients' clinical phenotype and genotype. Pharmacogenetics is the study of variations in treatment response according to genotype and is perhaps the next direction for genetic research in COPD. Here, we consider how knowledge of the pathophysiology and genetic risk factors for COPD may inform future management strategies for affected individuals. Chronic obstructive pulmonary disease (COPD) is characterized by airflow obstruction, together with an abnormal inflammatory response to noxious particles or gases . COPD is therefore diagnosed by spirometry, in which the ratio between the forced expiratory volume in the first second of expiration (FEV1) and the total volume expired (the forced vital capacity, FVC) is measured; COPD is diagnosed if this ratio is less than 0.7 after the administration of short acting bronchodilators, together with an impaired FEV1 . There are two main classification systems worldwide, issued by national respiratory societies, based on the severity of reduction of FEV1 compared with that predicted by age, gender and height (Table 1). The most widely accepted is the US/European system, which differs from the UK version only in that the most severe level (very severe) is omitted in the UK . Several pathologies can contribute to this impairment of lung function, and it is likely that COPD in its current definition comprises overlapping syndromes. Affected individuals show a range of pathologies, including chronic bronchitis , emphysema , bronchiectasis or a combination of these. Physiological tests of lung function can also identify impairment of small airway function, which is measured using forced mid-expiratory flow (FEF25-75%), and impairment of gas transfer, usually reported relative to effective alveolar volume and abbreviated as KCO. The small airways have been of great interest in studies of COPD , as changes in their function may be the earliest sign of disease. Impairment of gas transfer usually indicates disease of the lung parenchyma, which in the case of COPD predominantly relates to emphysema. Emphysema can be further subdivided according to its appearance and distribution on high resolution computed tomography (CT) scan. Emphysema in most cases of COPD is typically centrilobular in appearance (in the centre of a given section of lung), and predominantly in the upper regions of each lung. If it is due to α1 antitrypsin deficiency (AATD), the only widely accepted genetic predisposition to emphysema, it is usually panacinar (widespread throughout a given area of the lung) and lower zone dominant . Differences in physiology have been seen according to emphysema zone , although this aspect has not been studied in detail for COPD unrelated to AATD. This, together with genetic associations of emphysema zone [9, 10], suggest that upper and lower zone emphysema may also be distinct pathologies, which in turn implies that they may respond differently to therapeutic interventions. COPD is an important epidemiological problem worldwide. The prevalence was estimated to be 7.6%, rising closer to 10% in adults over 40, in a 2006 systematic review . However, prevalence estimates vary depending on the definition of COPD used and the sub-phenotype studied: the prevalence of chronic bronchitis was estimated at 6.4% and of emphysema at 1.8% . COPD is the registered cause of death in 920 cases per million of the population in the UK , and it is estimated that 1.5 million people in the UK have the condition, with up to 1 in 8 hospital admissions related to it . As with many lung diseases, cigarette smoking is an important etiological factor, and is widely accepted to be the main environmental risk factor for developing the disease. Despite this, only about 15% of smokers develop clinically significant disease , suggesting that there are other influences on disease expression. The contribution of smoking has been estimated to be 15% of the variability in lung function , and genetic factors account for a further 40% . Many genetic predispositions have been reported, increasingly in larger and better characterized populations, with growing confidence about their validity. Here, we briefly review the pathophysiology of COPD, in order to place the current evidence for genetic susceptibility in context, before considering how these features guide current and future management strategies. There are three main themes in COPD pathogenesis, which have, to some extent, guided genetic research and are considered in detail below. The first concerns imbalance between proteases that digest elastin and extracellular matrix in the lung and anti-proteases that protect against this process [17, 18]. Second, disparity between harmful oxidants and protective antioxidants may lead to dominant oxidative stress. Inflammation is the third key concept in COPD pathogenesis. This theory originated from the observation that patients with AATD develop early-onset emphysema . The α1 antitrypsin enzyme is an anti-protease, acting predominantly to block the action of neutrophil elastase, a serine protease released by neutrophils. Two other classes of protease have a role in COPD: cysteine proteases and matrix metalloproteases (MMPs) . Each is inhibited by one or more anti-proteases and may inactivate other anti-proteases or activate pro-inflammatory cytokines through proteinase-activated receptors . A key cytokine activated in this way is tumor necrosis factor alpha (TNFα). Proteases clear debris and damaged tissue, but if their action is not effectively controlled, they can produce excessive lung damage. Cigarette smoke is a major source of oxidants (mainly free radicals and nitric oxide), and reactive oxygen species are also produced by the interaction of smoke with epithelial cells and released by leukocytes, which accumulate in the lungs of smokers . Antioxidant enzymes in the airway include glutathione-S-transferase (GSTP), superoxide dismutase and catalase . Oxidants have direct toxic effects on respiratory epithelium , which then enhances pulmonary inflammation by upregulation of genes encoding pro-inflammatory cytokines . Inflammation can be stimulated by cigarette smoke , ozone  and particulate matter pollution . Transgenic mouse models illustrate its importance: when interleukin (IL)13 is overexpressed, mice show induction of MMPs and develop emphysema ; by contrast, TNFα knockout mice are relatively protected from emphysema after smoke exposure . In humans, airway infiltration by increasing numbers of inflammatory cells is seen as COPD progresses , and airway inflammatory cytokine levels correlate with disease progression . Furthermore, individuals with COPD have higher circulating levels of several inflammatory markers , although the relationship between pulmonary and systemic inflammation is not yet clear. Inflammation drives subsequent proteolytic and oxidant damage in COPD, so understanding the relationships between them is key to understanding its genetic associations and their implications for management. Given the complexity of the inflammatory cascade, combinations of anti-inflammatory, antioxidant and anti-protease drugs might be needed to adequately suppress the disease processes of COPD. With the advent of high-throughput genotyping, it may also become possible to choose treatments on the basis of the importance of each pathogenic process in the individual, something that is at least in part likely to be genetically determined. This concept is referred to as pharmacogenetics the study of variation in response to medications determined by genotype. Airways disease and parenchymal disease are both likely to have a genetic component . Some of the genetic associations that have been replicated in independent patient populations are summarized in Table 2. These focus predominantly on candidate genes suggested by the three pathways outlined above and are in addition to the accepted susceptibility conferred by AATD, which has been reviewed elsewhere . A role for nicotine addiction has also been suggested after an association was observed between polymorphisms in the α nicotinic acetylcholine receptor locus (CHRNA3/5) and COPD in one of the first genome-wide association studies (GWASs) for COPD . Whether this association truly represents altered smoking behavior or is distinct from it is debatable, as there are studies and theoretical reasons to support both arguments . Further GWASs are likely to follow in adequately powered, well characterized cohorts from studies such as ECLIPSE (Evaluation of COPD Longitudinally to Identify Potential Surrogate End points)  and COPDGene . GWASs have the potential to discover associations in areas not previously considered important in COPD, implying pathophysiological roles for their protein products, and thus extending our understanding of the condition beyond that of candidate gene studies. *Genes with evidence of an effect at genome-wide, meta-analysis or post-Bonferroni-correction level are in bold. †Most modern studies report these associations using the reference SNP number (rs...), but older studies often refer to the nucleotide change, whose nomenclature lists the more common allele, followed by the position of the SNP within the gene, and then the least common allele. For example, for TNFA, G-308A refers to a polymorphism at position -308 in the gene, which changes a G (guanine) residue to an A (adenine). The negative position indicates that it is in the promoter region. Alternatively, a SNP might be described by the effect it has on its protein product. This follows a similar system to that of nucleotide changes, such that, for example, in SOD3 Arg213Gly indicates a change from an arginine to a glycine residue at position 213 within the protein. Where such descriptors are common in the literature, both the rs number and these are shown. Abbreviations: GC, vitamin D binding protein; HMOX1, heme oxygenase; SFTPB, surfactant protein B; SOD, superoxide dismutase; TGFB, transforming growth factor β; UZDE, upper zone dominant emphysema. In many cases, replicated associations have been in different sub-groups of patients with COPD, and it is therefore debatable if these are true associations. For this reason it has become the gold standard to report associations in two COPD populations, phenotyped in the same way, in the same publication . Alternatively, confidence in the truth of the association might be gained by meta-analysis of the studies of any given polymorphism. Using these stricter standards for genetic association, the genes or regions most likely to be involved are the serine protease gene SERPINE2 , the MMP cluster on chromosome 11 [9, 38], the CHRNA3/5 locus , the hedgehog interacting protein gene HHIP [33, 39], the GSTPs , IL1RN , the microsomal epoxide hydrolase 1 gene (EPHX1)  and TNFA [40, 42]. Polymorphisms in some of these genes are relevant to known areas of pathogenesis: MMPs relate to protease anti-protease imbalance, the GSTPs and EPHX1 relate to oxidative stress, whereas TNFA and IL1B relate to inflammation. The association of SERPINE2 and HHIP deserve a little more consideration, because they imply that hitherto unrecognized proteins contribute to COPD. SERPINE2 is an inhibitor of trypsin-like serine proteases, related to AAT , although its major function is in coagulation and fibrinolysis . It was identified as a potential candidate gene for COPD by integration of an area of linkage on chromosome 2q33 from the Boston early-onset COPD cohort [45, 46] with knowledge of gene expression during murine lung development and from human lung microarray datasets . This showed SERPINE2 to be within the area of linkage (chromosome 2q33) and to be highly expressed in the lung, making it a logical candidate gene. Several studies now support a role for this gene in COPD, although the precise location of functional variants has yet to be determined. In the National Emphysema Treatment Trial cohort many SNPs were significantly associated  (the most associated being rs6734100 with FEV1/FVC, P = 0.00004), most of which were replicated by the International COPD Genetics Network (ICGN) and in a Norwegian case-control group . Conversely, a large European case-control study did not find any association with COPD  and questioned the validity of some of the results reported in the original study given that SNPs in complete linkage disequilibrium in the European cohort had different P-values for association from one another in the original study. Overexpression of SERPINE2 is associated with an increased risk of COPD , which is not consistent with its protective anti-protease actions. The mechanism of association may be through its role in coagulation because enhanced prothrombotic markers are associated with decline of FEV1 in COPD , although the role of such pathways in COPD pathogenesis has not been widely investigated. Alternatively, SERPINE2-mediated inhibition of plasminogen activator urokinase may be important, as this kinase is involved in activation of TGFβ and MMPs and is overexpressed in COPD . These are certainly promising avenues for future pharmacological interventions, to which SERPINE2 genotype may be relevant, but further research is needed in this area. Two SNPs within the HHIP gene (rs1851851 and rs13118928, both P < 2 × 10-7) showed a protective effect against COPD with a mean odds ratio of 0.72 , findings that are supported by a GWAS examining lung function in the general population . Their functional significance is not yet clear: HHIP encodes a signaling molecule (HIP1) that is present in most mammalian tissues  and interacts with hedgehog proteins to control morphogenesis . Its precise role in the lung is not yet known. However, its association with disease implies a role in COPD pathogenesis, but whether this would be amenable to pharmacological intervention or represents a developmental abnormality less amenable to change is not yet known. Therapy for COPD is mainly directed at airflow obstruction and inflammation, with additional treatment for exacerbations, which may be infective or non-infective. Thus, short- and long-acting bronchodilators, acting via β adrenoceptors (β2 agonists) and anticholinergic pathways, are recommended to be used in a stepwise manner, with the addition of inhaled steroids later in the disease. Current British Thoracic Society guidelines suggest that inhaled steroids should be combined with a long acting β2 agonist (LABA) and prescribed to patients when FEV1 is below 60% of the predicted normal value, and when the patient is experiencing regular exacerbations . Many of the newer treatments for COPD have been directed at individual components of inflammation, given its importance in pathogenesis. However, most, such as anti-TNFα therapies, have been disappointing . Treatment response differences between sub-phenotypes of COPD, which coexist in some study populations, could be a key factor. Some of the newer treatment strategies and their effects in clinical trials are shown in Table 3. Non-pharmacological interventions, such as pulmonary rehabilitation, which aims to improve patient fitness, are also effective , although it is possible that this too is influenced by genetics given the recent report of association of muscle wasting in COPD with the vitamin D receptor gene . *Refers to all studies of the drug class, which may have been carried out on other diseases. †Refers to genes relevant to the pathways on which each listed drug acts. ‡Refers to publications reporting clinical drug trials, studies of pharmacogenetics, and those genetic association studies not listed in Table 2. Further details can be found in the text. Abbreviations: LTB4, leukotriene B4; 6MWT, 6 minute walk test. The concept of pharmacogenetics and individually tailored therapy is now entering respiratory medicine, and reviews of the topic have recently been published with regard to asthma  and lung cancer . Specific pharmacogenetic studies of COPD are currently missing from the medical literature but those for asthma are growing in number [58, 59]. This suggests that similar work may follow for COPD, given that elements of treatment strategy, including bronchodilation, are the same for the two conditions. We can thus only speculate on the directions that pharmacogenetics of COPD may take, on the basis of current knowledge of the variation in treatment response to the classes of drug now used for COPD and that are entering the market, as described below. The future assessment of COPD and choice of management strategies might use both phenotyping and genotyping to guide choice of medication in each patient, perhaps using an algorithm such as that shown in Figure 1. 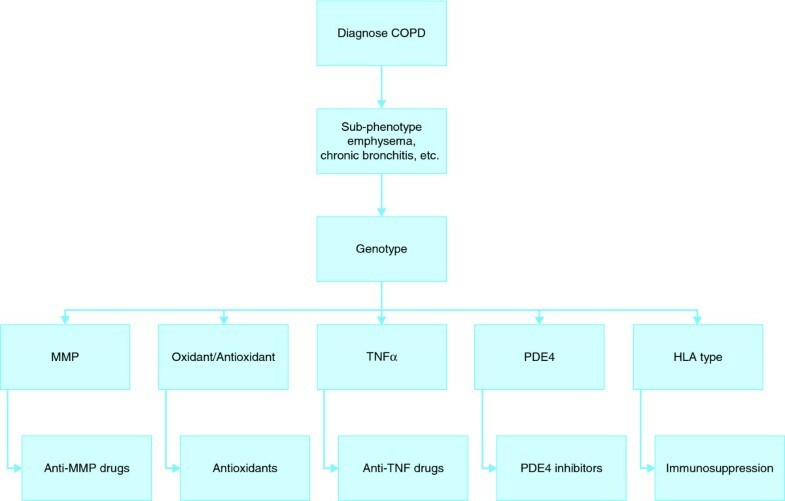 A possible COPD treatment algorithm based on pharmacogenetics. The chart shows a hypothetical system of using pharmacogenetics in COPD. After receiving a diagnosis of COPD, patients would undergo further tests to identify specific clinical features known to be influenced by genetics. Genotyping for the important polymorphisms would then be carried out to identify pathophysiologically important pathways, and therapy would be directed at those most active in the individual. Specific monitoring of response using target protein levels or clinical phenotype would then be carried out. This treatment algorithm might be used alongside established treatments, such as bronchodilators, or be used to aid rational use of expensive treatments. Short acting β2 agonists (SABAs) and LABAs are both important for treatment for COPD and asthma, because of their bronchodilator effects. However, some controversy over their use, at least for asthma, has occurred because LABAs have been associated with increased mortality . Variation in response to both SABAs  and LABAs  has been observed with polymorphisms in the β2 adrenoceptor gene (ADRB2), one of which has also been associated with COPD . The degree of reversibility of airflow obstruction shown by patients with COPD also varies considerably , although this relationship with ADBR2 genotype has not been studied. LABAs also have anti-inflammatory properties  that might prompt their continued use in COPD regardless of ADBR2 genotype, but the possibility remains that there is a sub-group within COPD patients who may benefit more from such therapy than others. Oral steroids are an established treatment for exacerbations of COPD and are used widely to treat autoimmunity because of their immunosuppressive effects. There has been a suggestion of a role for autoimmunity in COPD [66, 67], and the association of polymorphisms in CTLA4 , and possibly of human leukocyte antigen (HLA) type , with the condition suggests that there may be patients for whom this aspect of pathophysiology is important. Variation in both CTLA4  and the HLA region  is associated with other autoimmune diseases that typically respond to immunosuppression, suggesting that this might be a management strategy worth pursuing, in the stable state, for some individuals with COPD. Usually such treatments, in the form of oral steroids, are reserved for exacerbations of the disease, but if there is an autoimmune component, oral steroids and other immunosuppressants might be effective at other times as well. Phosphodiesterase 4 (PDE4) inhibitors are a promising COPD treatment [72–74], although gastrointestinal side effects necessitated cessation of therapy in 9% of subjects on the PDE4 inhibitor cilomilast . PDE4 polymorphisms have been associated with COPD , suggesting that there may be groups of patients for whom these pathways are particularly important in disease or who may respond differently to PDE4 inhibition. Similarly, MMP inhibitors have been limited in their clinical use because of side effects , but they may be most appropriately used in individuals for whom MMP-driven lung damage is the most important aspect of their COPD. Genetic variation may underlie increased MMP activity, particularly in upper-zone-dominant emphysema [9, 10], such that genotyping or specific phenotyping could identify patients most likely to benefit from treatment with this class of drug in COPD clinical trials. The results of the major controlled trial of anti-TNFα therapy in COPD, while not beneficial overall, gave the first hint that there might be subgroups within COPD that respond differently because the cachectic patients (those who were losing body mass, particularly fat free mass, regardless of food intake) showed better exercise capacity on the drug . This is consistent with the putative role of TNFα in systemic disease . Infliximab is used to treat a variety of other inflammatory conditions, such as Crohn's disease and rheumatoid arthritis, both of which are associated with variation in genes related to TNFα , and the response to infliximab relates to TNFα genotype . If there are sub-phenotypes of COPD that are clearly associated with polymorphisms in TNFα, this would provide a rationale for more targeted testing of anti-TNFα treatments. Reductions in COPD mortality have been observed with statins , another class of drug whose efficacy may be determined in part by genetic background . This drug class may be worthy of a more focused study in patients with both COPD and cardiovascular disease, a co-morbidity likely to result from shared inflammatory mechanisms . Indeed, co-morbidities may result from shared genetic susceptibility, suggesting that therapies targeting these pathways have potential to treat several conditions simultaneously. For example, both diabetes and low FEV1 show association with genes related to IL6 pathways [83, 84], and arterial disease and emphysema are both associated with variation in the MMP9 promoter [10, 85]. Leukotriene antagonists are used widely in asthma, but not yet in COPD, although there is some evidence of benefit (Table 3). This class of drug has been studied recently regarding its pharmacokinetics in asthmatics, and variations in response linked to polymorphism of the leukotriene C4 synthase gene . Although this gene has not been studied in COPD, this study  offers further evidence that clinical response to general classes of drug likely to be of benefit in airways disease may vary according to genetic background. Growing understanding of the genetics and mechanisms underlying COPD and the resultant sub-phenotypes of COPD supports a hypothesis that there may be identifiable groups of patients who will respond differently to treatments. This is because their underlying genotype has the potential to determine not only the specific pathological processes underlying a clinical phenotype of disease, which may dictate treatment response, but also influences drug metabolism and thus efficacy. This makes the study of pharmacogenetics an exciting prospect for COPD in the years to come. AMW and SLT declare they have no competing interests. RAS has received non-commercial grant funding from Talecris Biotherapeutics, who have not contributed to or reviewed this article. AMW and SLT drafted the article. RAS reviewed and approved it for submission.